The state-owned American Gothic House in Eldon, Iowa, made famous by painter Grant Wood, has lost its tenant. Beth Howard, who has been living there and baking and selling pies from the house since moving in back in 2010, becoming famous in the process, has moved out. Though she is a graduate of Davenport Assumption High School, Howard was born in Ottumwa and spent her early years there. Howard returned to Iowa as a new widow to operate Pitchfork Pie Stand and become known as the Pie Lady. 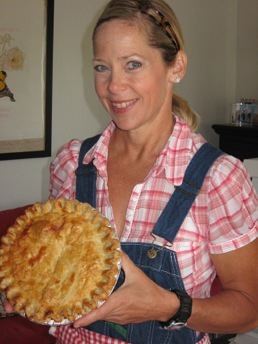 According to her blog, theworldneedsmorepie.com, Howard started her business for fun, but it has grown to the point where she could no longer contain it in the historic little house. She said she has looked at many possible solutions to manage the volume. They include buying a commercial oven, baking off-site at a bigger kitchen and renting a storefront. “But first and foremost I am a writer, and it was never my goal to run a pie business,” she writes. “My true mission is to encourage others to make and share their own homemade pie, as I believe the act of giving makes the world a better place. She now plans to start on her next book. She already has written two. “Making Piece: A Memoir of Love, Loss and Pie” was published in 2012 and a cookbook, “Ms. American Pie,” was released last April. My wife and I traveled to Eldon in August of 2012. We stepped into the American Gothic House, met Howard and bought some pies from her. They were delicious, by the way. Howard told us at the time she was a journalist. “But I don’t have time to write anything anymore,” she lamented. But that has now changed, and she encourages people to make their own pies. “I believe the world needs more pie. Especially homemade pie,” she writes in her blog. Copyright 2014 by Phil Roberts, Creative Enterprises. This piece ran as a column in The North Scott Press, Eldridge, Iowa.